Stylish and elegant. 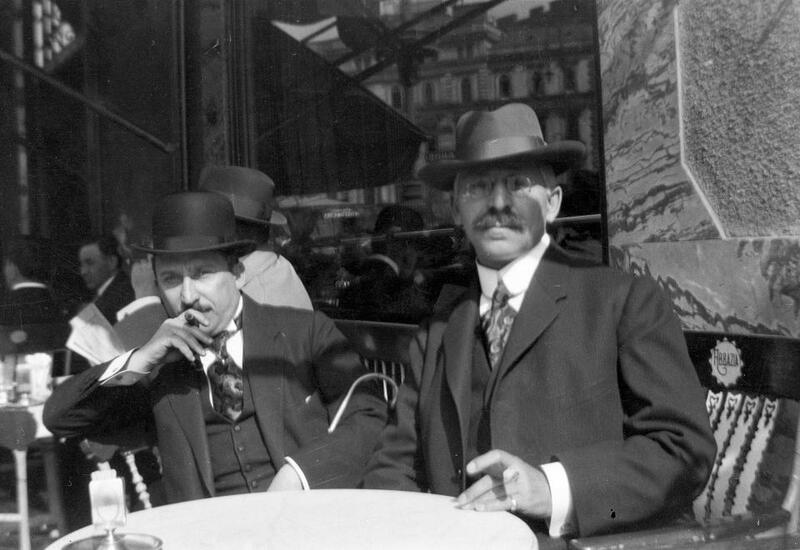 Customers on the terrace of Café Abbázia 1917. Only a reliable person could open a Coffeehouse (Kávéház) or a Coffee Shop (Kávémérés). The Coffee Shop could sell coffee, tea, milk and also patisserie products, but no music, dance, games, chessboards nor pool table, or any kind of entertainment were allowed. Strick closing hours is 11 pm, and opening is 3 am. Whilst, Coffeehouses were 24-hours businesses. There were 64 Coffeehouses in the Great Boulevard in Budapest in 1896 (around 500 in Budapest). By the beginning of WWI only 50 survived, and by WWII we could only count 25 Coffeehouses here. Nationalization, Communist era arrived, none of them survived. Before their revival could have started, fast food chains and banks protruded the premises for unrealistic rent.